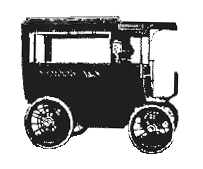 Ausonia built a series of cars, vans and omnibuses, electrically powered from 1902 to 1910 by the Societa Vetture Elettriche Camona, Giussani Turrinelli and Co., whose headquarters were in Milan and Sesto San workshops Giovanni. Electric vehicles were in vogue earlier this century because they were much more practical than the horse-drawn carriages used at the time and that drivers were still very undemanding in terms of speed. Italian companies that ventured into this type of construction were numerous; Among the most important four names were: Stigler, STAE, F.R.A.M. and Ausonia. Several of them managed to give a classic look to their vehicles by providing them with rear-wheel drive and concealing the batteries in double bottoms. FRAM, however, opted for the front Cantono, that is to say for a standalone device that was, at least in theory, applicable to any carriage ride by simply removing and replacing the pole at the front axle. Ausonia manufactured fully bodied vehicles with two electric 5 HP motors, each located at the same axis at the rear axle near by the wheels. The batteries were made up of forty-four, with a total capacity of 125 ampere-hours. Discharge normal cruising speed, would be around 20-25 amps, so the cars had a range of five to six hours. Driving the car being performed by means of a rheostat, with four forward positions, which could achieve speeds of 6, 12, 20 and 25 km/h respective and two reverse positions. The braking power, made possible through the provision of the circuit, completed a mechanical brake system which models were also fitted. This type of car was especially appreciated in 1906-907, during which the Ausonia vans conducting most of the postal traffic in Milan. But with the progress of light internal combustion engines, diffused these vehicles and a declining market suspended production in late 1910. However, commercial models, virtually indestructible, remained in service until the postwar period. Further Ausonia models, in 1908, were produced under Societa Anonima di Costruzione Elettriche and Meccaniche, gia Turrinelli and Co. and cars manufactured in 1909 and other electrically driven vehicles went under Silencieuse.